Since the mid-Twentieth century, the study of evolution has been divided into two sub-disciplines. Microevolution refers to evolutionary change within and among populations of a single species, and is the focus of fields such as population genetics. Macroevolution refers to evolutionary change at and above the level of the species. Studies of phylogenetics, diversification, and major phenotypic transitions all fall under the banner of macroevolution. Since it’s launch in 2010, Methods has become one of the most important venues for introducing new methods in macroevolutionary research, from approaches for producing time-calibrated trees, to novel algorithms for inferring rates of diversification or phenotypic evolution from phylogenetic comparative data. Most of the contributions to date have come from evolutionary biologists and understandably focus on how to analyze the kinds of data that biologists typically have – a time calibrated molecular phylogeny and data derived for those species in the tree. But there is another source of information on macroevolutionary pattern and process, but that has received less attention in the pages of MEE – I’m talking about the fossil record. The fossil record historically played a significant role in the development of macroevolutionary thought. Indeed, two of the landmark texts on macroevolution, George Gaylord Simpson’s Tempo and Mode in Evolution and Steve Stanley’s Macroevolution, were both written by paleontologists, and with a heavy focus on interpretation of fossil data. And even during the early days of the modern synthesis, workers from neontological and paleontological perspectives recognized the need to combine data to fully understand processes such as speciation, diversification, and trait evolution. Many readers of this blog might be surprised to learn, in fact, that the Society for the Study of Evolution and the journal Evolution arose from such a desire during the early and mid 1940’s. Progress since that time has been slow on both sides however. Both sides remain skeptical of each others’ methods and data and little dialogue occurs beyond the occasional symposium at a meeting or the more familiar “we should really think about working on this together” conversation over beers at a departmental social. Many paleontologists and biologists agree though that macroevolutionary researchers, regardless of their stratigraphic preference, have the most to gain when data from the fossil record are integrated into the rigorous statistical phylogenetic framework used by evolutionary biologists. This Special Feature is an attempt to initiate an integration of paleontological and neontological data in the pages of Methods in Ecology and Evolution. We have gathered five contributions by paleobiologists whose research uses phylogenies of fossil taxa to answer diverse macroevolutionary questions from time scaling phylogenies to inferring modes of phenotypic and lineage diversification. It’s important to stress that these papers are not written by or for paleontologists. These papers are written for students of macroevolution, whether studied in the fossil record or from living species. As our questions about pattern and process in evolution become more sophisticated and our methods develop to meet them, a more sophisticated understanding of fossil data is going to become a requirement for biologists, while paleontologists will be unable to escape rigor of phylogenetic statistics. The contributions in this special feature will hopefully represent the first step towards a more synthetic approach to macroevolutionary research. 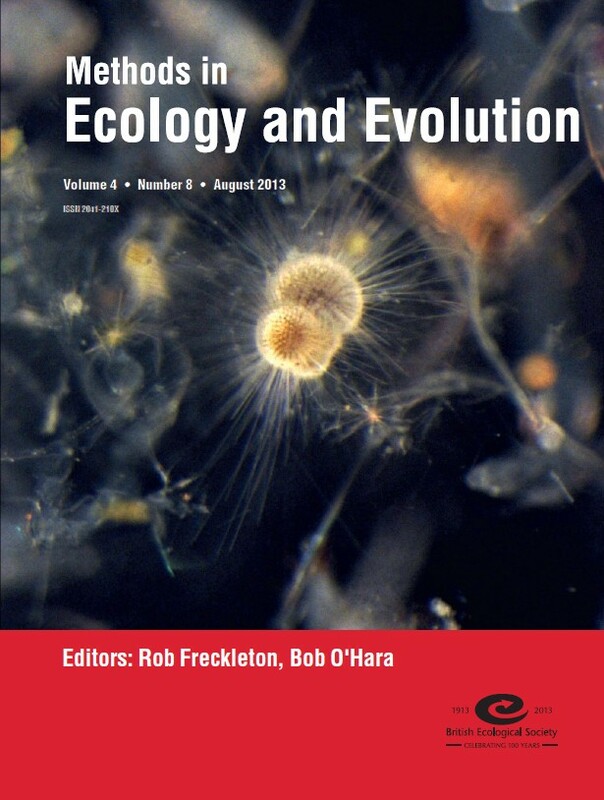 About the cover: This cover image is of Globigerinoides trilobus, a species of macroperforate planktonic foraminifera that originated around 22 million years ago. This live individual was photographed during the GLOW research cruise to the South West Indian Ocean in 2009 and is less than a millimetre in size. Microscopic protists like these occur in great numbers in marine sediments and, with genetic material increasingly available, the group has great potential for an integrated approach to studying macroevolutionary patterns over long timescales. In the accompanying Special Feature paper “Inclusion of a near-complete fossil record reveals speciation-related molecular evolution”, the authors use stratigraphic, phylogenetic and ecological data from the fossil record of Cenozoic macroperforate planktonic foraminifera, to test if among-lineage rate heterogeneity is explained by ecological factors and by the numbers of speciation events according to fossil lineage, fossil morphospecies and molecular species concepts. This entry was posted in General, Methods papers by Samantha Ponton. Bookmark the permalink.